Each week there is a philosophical practice that can be easily and readily applied in day to day life. These are designed to help us take real steps to try out the ideas put forward in the newsletter. Each week we present a reflection taken from the book 'Philosophy Works'. If you no longer wish to receive the newsletter Unsubscribe . 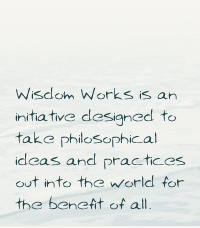 Do you know someone who would appreciate Wisdom Works? Click here to send them details about it. At the heart of nearly all the great philosophical systems of the world are practices in reflection. Socrates called these exercises ‘the ultimate activity of the wise’. In Wisdom Works we call this exercise Self Remembering. By connecting ourselves with the immediate present we become alive to life. It is to help us with this that Self Remembering is offered. Accessed from the home page, we hope that this will be one of the first things that you will meet. It acts as a cornerstone of all that we do. It can be accessed at any time, remaining as a constant reminder of the reflective life. We ask you to go through the process slowly and calmly. Consciously rest at each step in turn. 1. Allow your body to fall still. 2. Let go of the concerns that at present possess your mind. 3. Come into the present. 4. Bring your body into view and allow physical tension to dissolve. 5. Simply look. Look at colour, form, light, and the space that penetrates it all. 6. Now listen. Listen to sound, and the silence out of which these sounds arise. 7. Rest in the awareness of all that is around you. 8. Become conscious of the power of the present in all its harmony and peace. Now turn out and face the world refreshed. If you would like to appreciate this process more deeply, follow the steps once more, reading the commentary as you go. First Step: Come to stillness. Why stillness? What has that to recommend it? Besides stillness can never be achieved. As long as we are living, something is in motion. The body moves in order to sustain and regenerate, as indeed does the mind. But so much of our activity, both physical and mental, is unnecessary and stress laden. There are those of us that seem to be unable to find stillness in any form. And even the most lethargic may very well be in a state of exhaustion because of unnecessary mental activity. What is certainly true is that for those whose life is a continual whirl, peace is a blessed gift. Perhaps what is even more important is that the only way we can respond intelligently and creatively to life is by freeing ourselves from surface agitation in order to touch a quieter and more potent place in ourselves. Second step: Letting go of the concerns that are at present possessing your mind. The source of all this unnecessary agitation is often concern of one kind or another. Many of these concerns are only too obvious, but for others they are there hardly recognised, manifesting as a background interference of stressful agitation. As the body starts to become still so the physical tensions start to dissolve. These physical tensions are maintained by this constant mental and emotional agitation. The first step in stilling them is achieved by stilling the body. As the agitations arise they have their effect on the body. Conversely, by stilling the body, heart and mind are encouraged to come to stillness. Third Step: Come into the present. The present is all-important. The only time life lives is now. It doesn't live in the past and the future never comes. As living creatures our most essential ingredient is life itself, and we must learn to live when life lives. Therefore, constantly come back to the present. Fourth Step: Bring your body into view, and allow physical tension to dissolve. Remain grounded. Bring your attention back to your body, limb by limb: feet on the floor, weight of the body on the chair. Release tension in the stomach muscles. Be aware of the evenness of breath. And in all this, rest ever deeper in stillness. As the agitating thoughts begin to arise, bring the body back into view. Release tension. Grow in stillness. Then turn your attention completely out. Step Five: Simply look. Look at colour, form, light, and the space that penetrates it all. Connect mind with the senses. There is a world out there and it is so easy to pass through life without ever being truly in touch. NOW is your chance to connect. There is no other time. Be aware of the vast variety contained in the colour and the form of things. Notice their shape and texture. Be aware of light and shade and above all the space that surrounds and interpenetrates everything. Step Six: Now listen. Listen to sound, and the silence out of which these sounds arise. Hearing is the finest of the senses. Traditional wisdom states that the five senses are each related to one of the five elements. Hearing is related to the finest: ether. When full connection with this sense is achieved, there is silence discovered at the heart of sound. Try it. The sounds arise out of this silence. They hold for a while and then disappear back into the silence. Step Seven: Rest in the awareness of all that is around you. Mind will inevitably be caught by the things that arise before it, but returning to open awareness brings depth to your thoughts and feelings. Space and silence are to be found just as much within as without. Beneath all the agitations of thought and emotion, unaffected by any of it, is space and silence. With this appreciation there will come the awareness that everywhere there is intelligence to be discovered, in so many different ways, intelligence and beauty, and it's manifesting now. In fact it's only in the awareness of this present moment can we act beautifully and intelligently in a way that is entirely appropriate to the present need. Stage Eight: Become conscious of the power of the present in all its harmony and peace. With greater awareness of this power comes the acknowledgement that this power has peace as one of its major attributes. This power by its very nature harmonises a discordant mind and brings peace. It also brings us back to the present where things are really lit. The current situation arises precisely in the present, and if we are to fully meet the situations we are presented with, it's to the present we must continually return. Retaining the stillness and presence that is to be discovered in this practice, turn out to meet the current need, spontaneously and creatively. To prove all this to yourself practise now. Quietly go through the stages before reading on. So what is the alternative? We all know what the alternative is. It's what we normally experience as my life. We know we are alive and certain of our existence, but are we always the same person when we seem to be changing all the time? We are often under the sway of passing moods, caught by confining ideas, possessed by the situations we meet. No one would be false to themselves willingly, but life has a way of drawing us in and encouraging us in the habit of forgetting. And the more we forget the less energy we seem to have, and less freedom. Self-forgetting would of course be far less of a possibility if Self Remembering became part of our life. Self Remembering allows us to become alive to life. It offers us a way of reconnecting with our essential energy and discovering of our own individual purpose.